A Subedar in the 53rd Sikhs (Frontier Force) who was born in the village of Atari in the district of Amritsar, East Punjab. 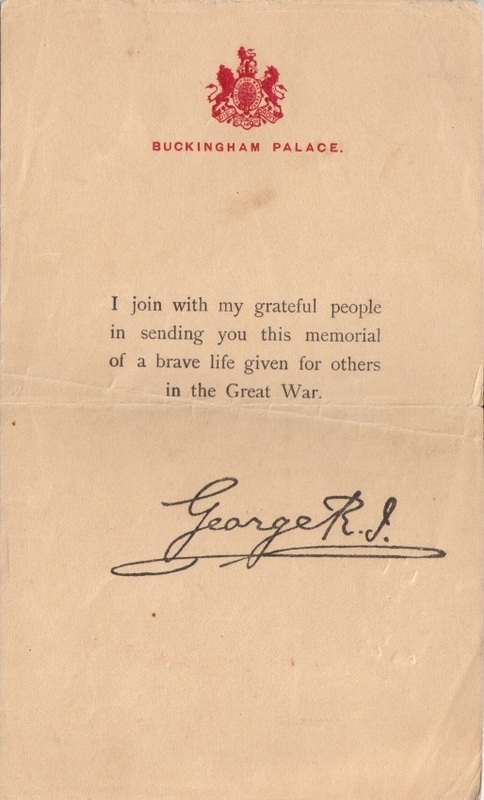 He fought and died in Mesopotamia on 8 March 1916. His life has been researched by his great-granddaughter, Citizen Historian Kamal Patheja. Surat Singh was born in 1889 in the village of Atari in the district of Amritsar to Sardar Chanda Singh and Sardarni Aas Kaur. Chanda Singh was the grandson of the illustrious General Sham Singh Atariwala who died a martyr at the Battle of Sobraon, the final clash of the First Anglo-Sikh War (1845-46). Surat Singh was educated at Aitchison Chief's College, Lahore. He joined the Indian Army on 1 October 1906 as a Viceroy's Commissioned Officer (VCO) in the 53rd Sikhs (Frontier Force). He was promoted to the senior rank of Subedar on 10 June 1910 (see Indian Army List, January 1915, p 520). He married Sardarni Devinder Kaur. 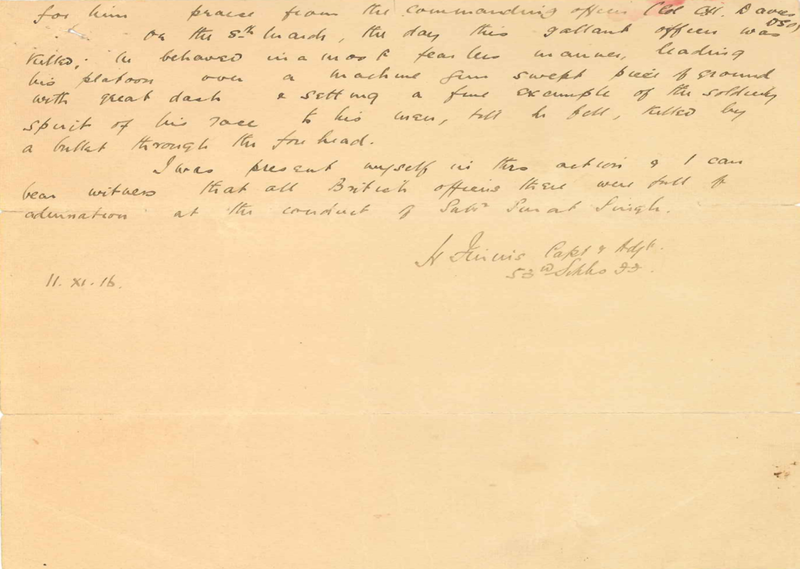 What the family know of Surat Singh's war experiences and the cause of his death is to be found in a letter written by the regiment's Adjutant, Captain H. Finnis, that has been preserved by the family (see images). Dated 11 November 1916, Captain Finnis explains how the 53rd Sikhs received orders to mobilise on the 12 October 1914. The commanding officer left Surat Singh, a senior Indian officer, at the depot in India to aid in the recruiting effort. The letter explains that Surat Singh's Company of Manjha Sikhs (ie Sikhs from the district of Amritsar) 'suffered so heavily in Indian officers [killed or wounded] that he was sent out to Mesopotamia, with a draft leaving the depot on 9th December 1915'. Surat Singh and his reinforcements arrived at regimental head quarters at El Orah in February 1916. During the march from Basra to the front, conditions were extremely difficult, with a harsh climate and arduous terrain to contend with. The toll taken on the British officers was significant. The officer in charge of the draft later reported to Captain Finnis that Surat Singh 'had been of the greatest help to him' during this testing time. Shortly after arriving at El Orah, Surat Singh accompanied the regiment to the trenches in the Hanna position, which was where a major battle had been fought on 21 January 1916 between the Ottoman Army and Anglo-Indian forces. Surat Singh distinguished himself more than once during trench warfare and also when commanding burial parties at night, earning praise from his commanding officer, Colonel C.H. Davies. On 8 March 1916, Surat Singh behaved in ‘a most fearless manner, leading his platoon over a machine gun swept piece of ground with great dash and setting a fine example of the soldierly spirit of his race to his men'. It was in this action that he was killed by a burst of machine gun fire that struck him in the forehead. I was present myself in this action and I can bear witness that all British officers there were full of admiration at the conduct of Subedar Surat Singh. 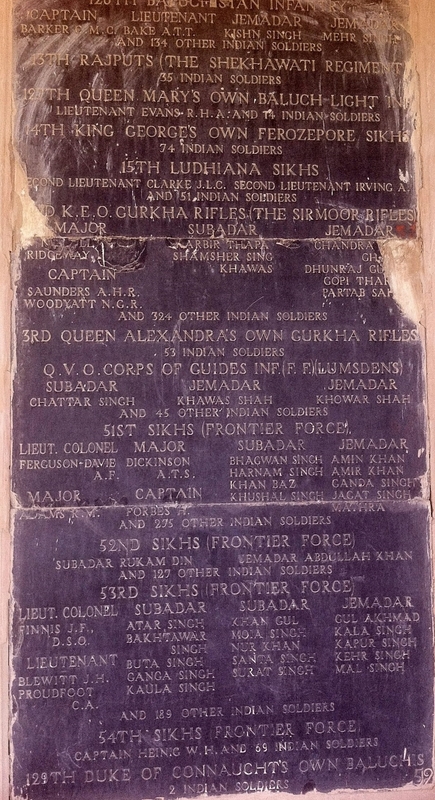 Surat Singh is memorialsed on panel 53 on the Basra memorial in modern-day Iraq (see images). At the time of his death, Surat Singh and Devinder Kaur had two children, a daughter, Autar Kaur, aged five and a son, Gurbakhsh Singh, aged just eight days old. Like his father, Gurbakhsh Singh was educated at Aitchison Chief's College, Lahore and went on to serve in the Second World War. Surat Singh's family surname is Sidhu. Before the partition of Punjab in 1947, Surat Singh’s grandson, Colonel Gurbans Singh Atariwala, was also educated at Aitchison Chief's College, Lahore, and later at Yadavindra Public School, Patiala, and Khalsa College, Amritsar. He also joined the Indian Army in 1960, was wounded and decorated for gallantry and retired in 1991. He now lives in Canada. Colonel Gurbans Singh Atariwala (retired) and other family members maintain a museum at Atari. On 8 March 2016, the family commemorated the 100 year anniversary of Surat Singh’s death by holding an Akhand Path at the Samadh (tomb) of General Sham Singh Atariwala and placing a plaque in his honour at the family museum in Atari. Surat Singh was also honoured by various dignitaries, including the Prime Minister of India, to mark the 100 years since his death. 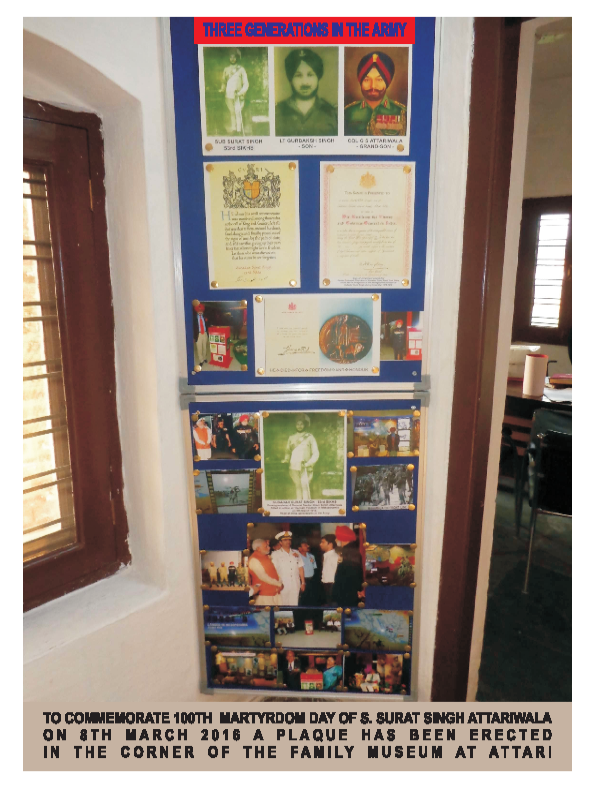 A pillar with the history of the immediate family was displayed at the Infantry School, Mhow. Gurbakhsh Singh, the son of Surat Singh and father of Colonel Gurbans Singh Atariwala, was granted a ‘Jangi Inam’ – a special pension granted to the soldier and their next generation – along with 125 acres of land in recognition of his father’s sacrifice during the Great War. Most of Surat Singh's grandchildren live in Canada. The eldest grandchild, Mrs Rajbans Kaur Gill, lives in England.